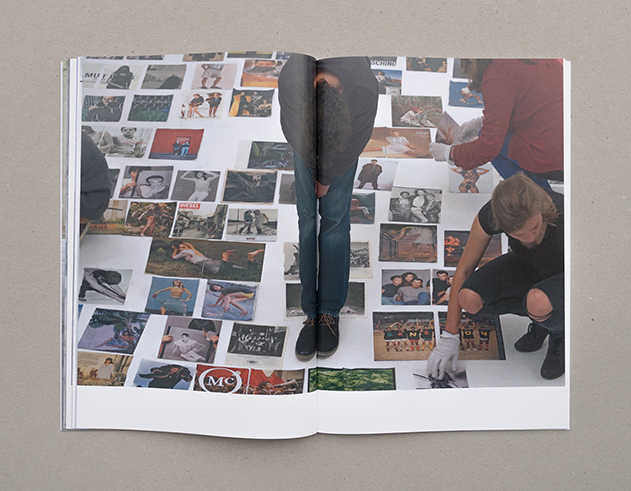 In the year 2014, we presented the exhibition “The Militant Image: Picturing What Is Already Going On, Or The Poetics of the Militant Image” together with Urban Subjects (Sabine Bitter, Jeff Derksen, and Helmut Weber), along with a publication of the same name. The focus here was on the militant image both as a condition of an image and an image of a condition. 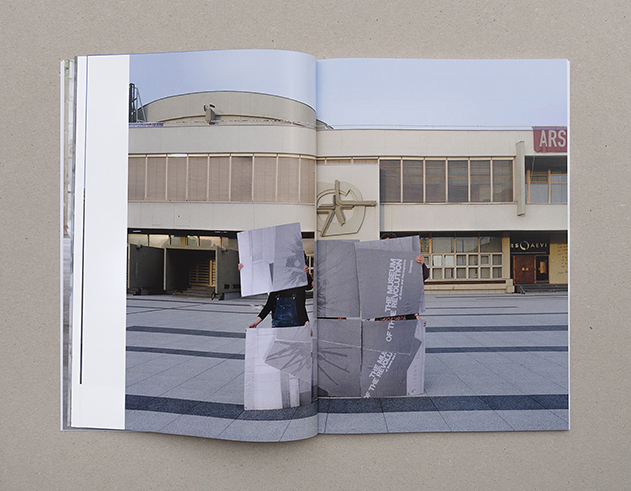 Tying into this collaborative research, we invited Urban Subjects to reflect, as guest editors, on a concept for an issue of the magazine Camera Austria International. After the most pressing questions were explored, a different term seemed more suitable for facilitating access to images, texts, and publics: sincerity. The idea of sincerity may seem a bit anachronistic or out of touch with the times, as if bound to a subjectivity that we are no longer really able to maintain. Yet sincerity still continues to traverse the aesthetic and the social, and it arises in quite unsuspecting places. It is not actually necessary to broach the much discussed subject of fake or alternative news in order to encounter the question of sincerity these days—since the 1990s it has been virulent, when the digital seemed to undermine any sense of credibility of the images, and since imagery has been marked by general suspicion. From this point on, the mechanisms for authenticating images have shifted, with their effects taking centre stage rather than the truth of that being rendered. Since then, images have not shown a sincere image, but rather performed it. However, they never perform it alone. Urban Subjects has consequently broadened their argument of the necessity of sincerity to include the areas of language and poetry, especially in the realm of resistive political practice and with an emphasis on its enmeshment with images and texts—particularly the practice of sincerity, which is not a quality, but actually a social state where images, texts, poetry, bodies, and actions are integrated or even able to make possible the presence of sincerity. In his introduction, Jeff Derksen traces the history of sincerity, while placing the artists selected for this publication in relation to this history and also in relation to one another. The concept of sincerity compels us to consider, in its appealing simplicity but also fundamentally, our relationship to photographic images, whether they are tied into artistic practice or everyday cultural contexts: Why are we still inspired by photographs? Why do we look at them? What do we expect from them? These questions are also associated with a hope that sincerity might be able to produce, not only represent, sincere acts—that is, not only to render the image of a condition, but also to effectuate this state. We are grateful to Urban Subjects for the collaborative exploration, already lasting for a very extended period, of how the visuality of photography interferes in our present day in ever new ways and in ever new spaces of agency—and for, with their contribution, turning the magazine Camera Austria International once again into a platform fostering topical reflection on photography. After the review section was omitted from the previous issue, since devoted to the Camera Austria archive, we are now offering you an extensive overview of exhibitions held over the past six months. 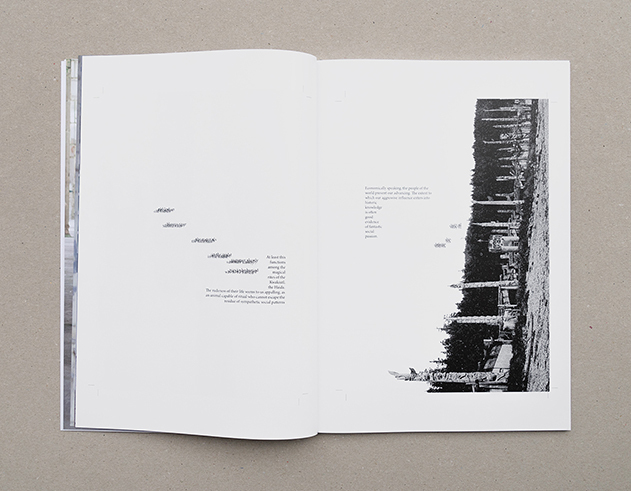 Cover: Jordan Abel, page from: The Place of Scraps (Vancouver: Talonbooks, 2013). 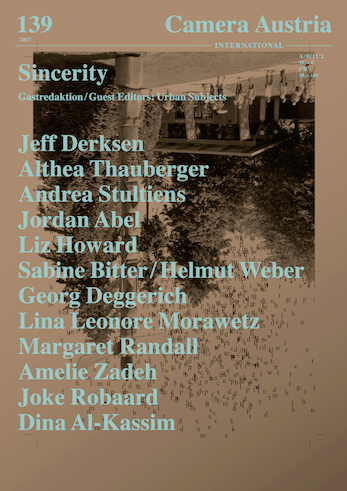 With this gathering of the work of artists, writers, and poets from Europe and North America, we want to make an argument, or at least launch a plea, for the aesthetic, material, and social possibilities of sincerity. To do this, we look back to sincerity’s history and pull forward moments where it speaks to our own strange and taut present. It is a necessary time to rethink sincerity, partly because of the strangeness of sincerity historically and its performance, both positively and negatively, today. Sincerity mediates our relationship to the present, and the present shapes sincerity as part of what Raymond Williams calls, beautifully, the “structures of feeling” we live within: these unfixed yet defining formations and positions are shot through with sincerity. For do not many of the most compelling political formations today draw on a social sincerity to come together and demand, at a number of scales and sites, that another world be made (a step further than imaging another world to be possible)? This gathering of works raises the question of how sincerity surfaces at times of social and historical shift, from the changes in the global economy and the national public spheres, to the intensity of the moment of the cultural front in North America, and to the forms of sincerity that are generated in new political formations and artistic practices today. So, with this relational collection of works, we hope that sincerity can itself be seen as a productive space—as a political and aesthetic intensity between historical subjects—because of its contradictions, but also because of its necessity. Text feature in Camera Austria International 139/2017, pp. 7–10. Künstlerbeitrag / Artist feature in Camera Austria International 139/2017, S. / pp. 11–15. 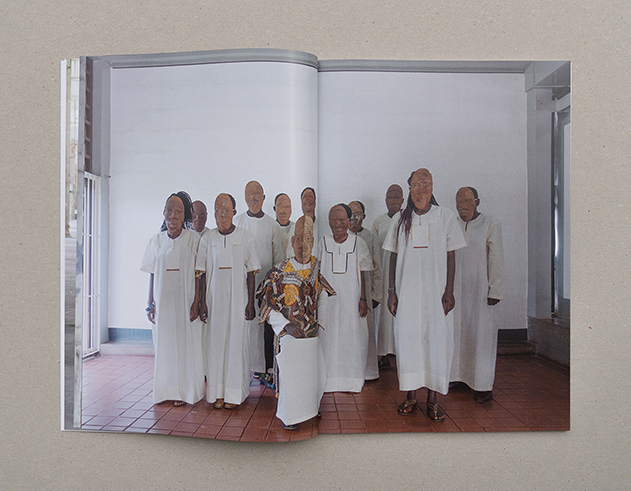 Doppelseite / spread: Althea Thauberger, S. / pp. 12–13. Courtesy: die Künstlerin / the artist. Künstlerbeitrag / Artist feature in Camera Austria International 139/2017, S. / pp. 22–25. 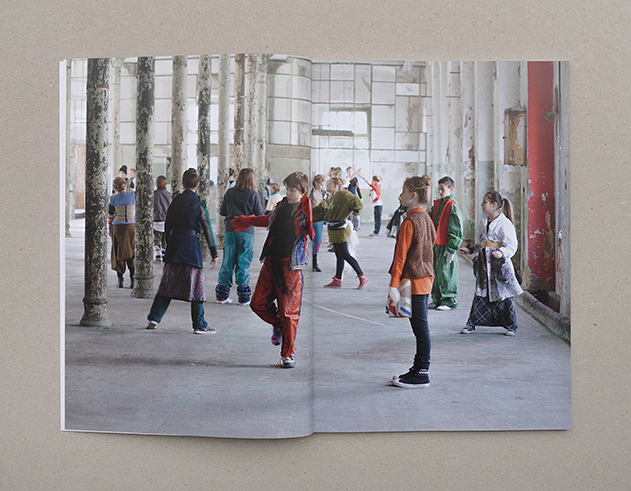 Doppelseite / spread: Andrea Stultiens, S. / pp. 16–21. Doppelseite / spread: Jordan Abel, S. / pp. 24–25. Courtesy: der Künstler / the artist und / and Talonbooks. Künstlerbeitrag / Artist feature in Camera Austria International 139/2017, S. / pp. 29–34. Doppelseite / spread: Sabine Bitter / Helmut Weber, S. / pp. 32–33. LM In Holocaust, Reznikoff carried to an extreme the poetological method of a “radical Objectivism,” which he developed over a period of more than forty years. He extracted, quite similar to an archivist, “tissue samples from the documentary mass” (Jacques Roubaud). In the case of Holocaust, this pertained to court records from the Nuremberg trials and from the Eichmann trial in Jerusalem. At the same time, Reznikoff strongly intervened in the text with techniques of selection, densification, and linguistic revision. How exactly should we view the poetological method as applied to the inception of the Holocaust poems? GD It is true that the content of all poems in Holocaust is based on the documents you just mentioned. Reznikoff did not add anything to the texts or interpret the material in any way. This is an important point, because Reznikoff’s concern was “documentary poetry,” which lends a voice to the victims of the Holocaust, while the poet himself stays completely outside of the poem. His only role is to be a mediator of language. Text feature in Camera Austria International 139/2017, pp. 35–38. Künstlerbeitrag / Artist feature in Camera Austria International 139/2017, S. / pp. 39–42. 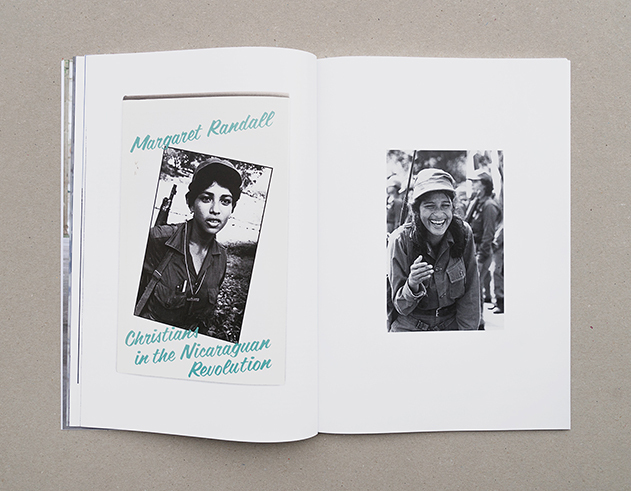 Doppelseite / spread: Margaret Randall, S. / pp. 40–41. Künstlerbeitrag / Artist feature in Camera Austria International 139/2017, S. / pp. 43–47. Doppelseite / spread: Amelie Zadeh, S. / pp. 46–47. Künstlerbeitrag / Artist feature in Camera Austria International 139/2017, S. / pp. 48–50. Doppelseite / spread: Joke Robaard, S. / pp. 48–49. supremacist nationalism, and the needful reassertion of anti-racism/anti-colonialism, feminism, queer theory, and critical aesthetic practice—the notion that supposed solidarity and exploitation coincide in the same agents of progress surfaces with undeniable insistence. Sincerity “itself” must stand the test of a new socius that increasingly reveals a simple fact: agency is not sovereign sincerity but a social process of relation. Questions of responsibility and authenticity are raised once again in the context of neoliberal multiculturalism gone awry and global right-wing resurgence against imagined identity politics, yet the discussion proceeds asymmetrically; just as Narcissus knows nothing of the lake that returns his gaze, just as he falls captive to his own reflected pleasure given back to him as “self-knowledge,” so the sovereign imagination knows nothing of the delicate ecology that cannot be reduced to intentions, good or bad. And in this version, Echo remains unheard and unremarked. ¹ Gayatri Chakravorty Spivak, “Imperative to Re-Imagine the Planet”, in An Aesthetic Education in the Era of Globalization (Cambridge, MA, and London: Harvard University Press, 2012), pp. 335–350, 344. Text feature in Camera Austria International 139/2017, pp. 51–54. Owner: Verein CAMERA AUSTRIA. Labor für Fotografie und Theorie. Editors: Margit Neuhold, Christina Töpfer, Sabine Weier. 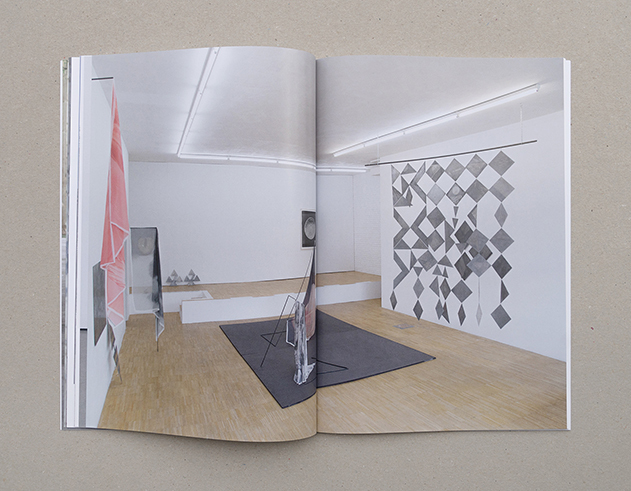 Translations: Dawn Michelle d’Atri, Nicholas Huckle, Amy Klement, Otmar Lichtenwörther, Lina Leonore Morawetz, Katrin Mundt, Sabine Weier. English proofreading: Dawn Michelle d’Atri. Acknowledgments: Jordan Abel, Dina Al-Kassim, Sabine Bitter, Anja Bogojević, Georg Deggerich, Jeff Derksen, Arno Gisinger, Liz Howard, Lena Leeb-Lundberg, Margarethe Makovec, Lina Leonore Morawetz, Tony Power, Amila Puzić, Margaret Randall, Joke Robaard, Ian Song, Kate Strain, Nina Strand, Talonbooks, Althea Thauberger, Helmut Weber, Amelie Zadeh. No parts of this magazine may be reproduced without publisher’s permission. Camera Austria International does not assume any responsibility for submitted texts and original materials.